This week’s three-day protest by residents of Alexandra will continue tomorrow after Johannesburg Mayor Herman Mashaba did not attend a meeting they held on Friday. This week, residents blocked traffic and burnt tyres in an attempt to be heard, and they have vowed to continue protesting until their demands for housing, electricity and municipal services – such as refuse collection – are met. The protests were organised by community members, as well as activists and community counsellors in Alexandra. Those to whom City Press spoke rubbished suggestions that the protest was part of electioneering ahead of next month’s vote. Addressing the crowd, ANC Youth League member Kenneth Mgaga dismissed suggestions that the protests were an electioneering ploy, but said it was a community issue. “We do not belong to anybody. We have different political parties, but we came here as members of the community, not members of the ANC. Members of the ANC, the EFF, the DA and other parties are all here,” he said. “And we are happy that you all are here so speak your mind. We also want to dispel the idea that people from Alexandra are xenophobic or lazy. We love our Somali brothers and sisters; we have stayed with them for a long time – we even have kids with them. “We are also not lazy. We want to go to work and our children want to go to school, but we have to protest just to be heard. We have behaved and instructed the community to not vandalise, but we had to burn something to get attention, and we burnt tyres. It seems Herman Mashaba is still not taking us seriously,” he said, to cheers from the crowd. Residents say many of their service delivery problems began in 2016 under the new DA administration, which had promised them change. Matilda Khambule (65) said that after former mayor Parks Tau left, the conditions in Alexandra worsened. “I am born and bred in Alex. It used to be a nice place, even though the houses are old-fashioned. We could do everything, and development had begun in Alexandra under the ANC. But under the new administration after 2016, things changed,” she said. “When we call the police, they say they have no right to assist us. When Parks Tau was mayor, we renovated dumping sights in Alexandra into gardens that we use to feed our people. "When Mashaba came, things changed. People entered our gardens and invaded them. Even when we report the issues to the cops, they don’t help us. Structures in Alexandra are there, but they are not well maintained or serviced. 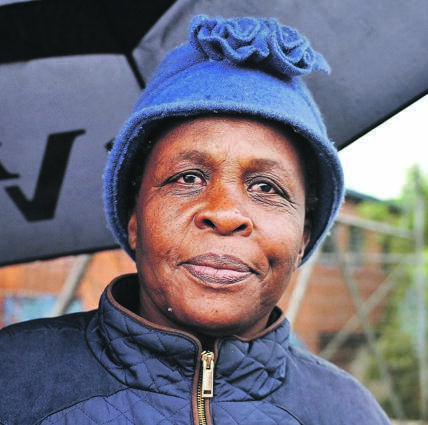 The ANC used to help us and give us houses,” she insisted. Given Mkhize (28), who addressed the crowd during the meeting, said he did not belong to any political party, but believed the mayor had ignored the people of Alexandra. In a statement on Friday, Mashaba said reports that he was meant to address residents were “malicious” and that he was leading a funeral at the time. “The people of Alexandra have been mistreated by decades of promises made on the eve of elections for the sake of narrow political gain,” he said, adding that he would meet with them on April 15 during a scheduled public consultation, where service delivery would be discussed. His spokesperson, Luyanda Mfeka, said that, since the beginning of the protest, Mashaba “has expressed his willingness to engage with the grievances of the community ... and attempted to engage the leadership of the protest”. Mfeka said the city was well aware of service delivery problems in the township and had introduced an additional cleaning shift in informal settlements. He added that the metro police provided visible policing “within its limited jurisdiction”. Mfeka denied Mashaba had painted Alexandra’s residents as xenophobic and lazy. Also affected by the protests were the business owners of the township, like hair dresser and salon owner Sydney Cetimani who said he supported the protests but hopes that no properties would be vandalised. But residents like Mkhize are adamant that the protests will continue tomorrow. “Service delivery in Alex is poor. Most of the time when they (the city) promises stuff they don’t come as they promised. They promise to clean sewage and they only clean certain parts of Alex. "Yes we live in poor conditions but this does not mean we should be shut out, the Mayor needs to treat us as well as all communities. “I am not a ANC, EFF or DA member, I just need to see change in our community. If people think this it’s politically motivated, it’s not.